Is there any tutorial for using the Volume tool in the Grid in GeoMedia. I checked the 11 Grid tutorials at http://community.hexagongeospatial.com/t5/GeoMedia-Tutorials/Grid-Analysis/ta-p/604, but none of them covered the Grid volume command. The GeoMedia help file has documentation on the Grid volume command and includes 2 examples - have you seen that? If you've tried using the Grid volume command and are having trouble, you could log a support worksheet for assistance. If you'd like to request that a new tutorial on the Grid volume command be created, you could log a new Product idea on the Product Ideas board. Here's a document of assorted Volume methods using GeoMedia/Imagestation i put together back in 2016. There is some info on Grid Volume in Method 3. May be of use. There is another way arround besides Geomedia GRID (limited to 32Kx32K raster cells maximum) - Spatial models. The same spatial model but probably with minor modifications shall run in Geomedia 2018. The main problem is degree of generalisation of LAS point clouds from LIDAR or photogrammetry. Even if surface is not changed in Nature the second point cloud is always different. Geomedia GRID has much more tools/functions for Surface interpolation as Spatial models now. 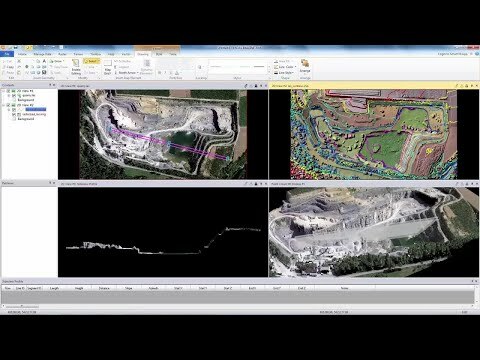 Quarry Volume Change Identification and Computation with ERDAS IMAGINE.